Inflammatory liposarcomas show a prominent lympho-plasmacytic infiltrate superimposed on the background of a well-differentiated liposarcoma. 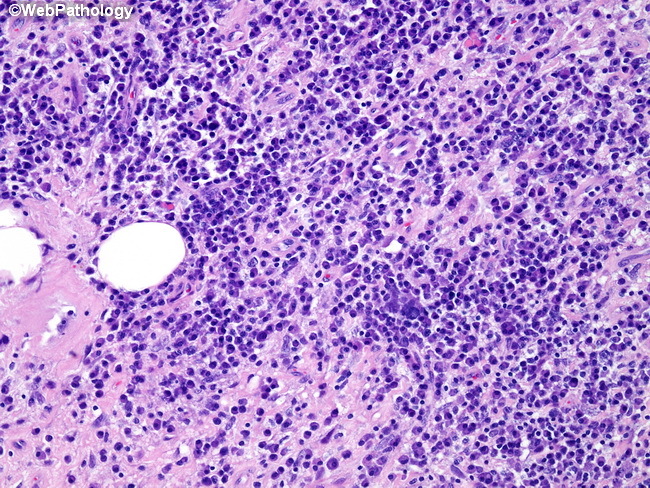 This may obscure the sarcoma component and lead to a mistaken diagnosis of a lymphoma or an fibrous pseudotumor. However, on careful examination, one usually sees the atypical spindle cells in the background. The nuclear irregularities in the spindle cell component of inflammatory liposarcomas are more pronounced than those seen in fibrous pseudotumors.